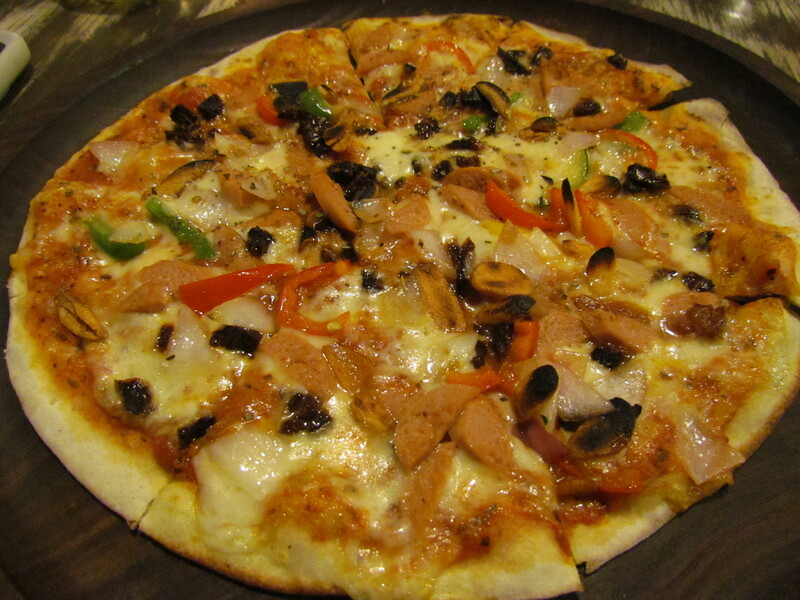 Awesome slim pizzas at fat Lulu’s that r cheaper & much superior than the average fare served by MNC pizzawalas. I pinched myself to ascertain whether I was dreaming or awake – as the food hit my tastebuds. 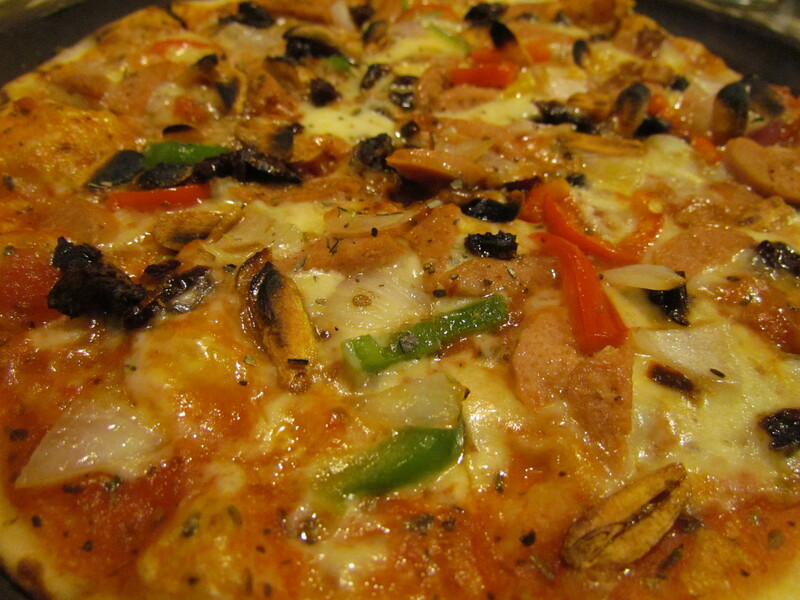 Pizza is a common snack that has become almost an indian food in a decade & half of its getting popularized. MNC pizzawalas like Dominoes Pizza, Pizza Hut etc rule the market with their ‘average to good but seldom outstanding’ breaded & other pizzas, mainly due to smart marketing. Then come the expensive ‘Italian’ restaurants like Tonino, Spagetti Kitchen etc which serve good pizzas but u easily end up spending Rs. 2000+. Good Budget Pizzas were a miss in general & Fat Lulu’s has just filled the void. Between both of us we had 3 pizzas (8 inch) back to back for dinner & we kept craving for more………………….. alas our stomach pouches raised red flags beyond 3. 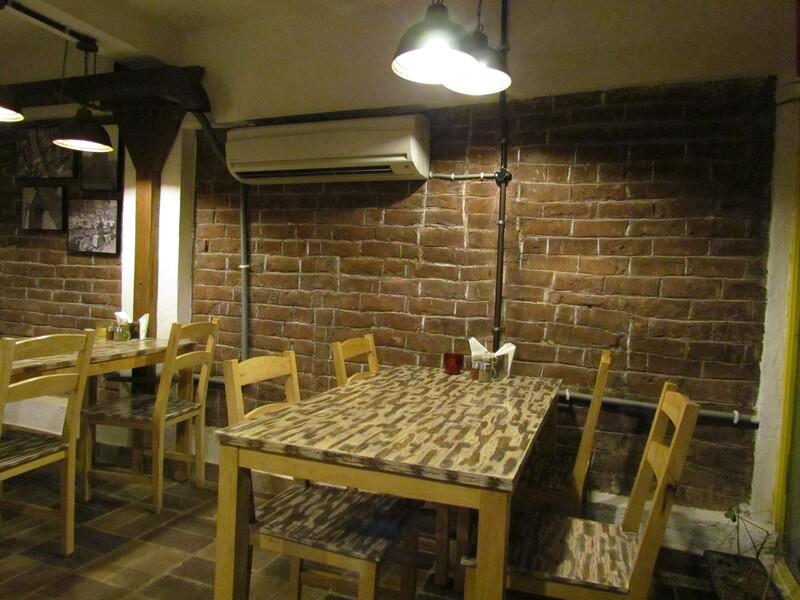 The Restaurant has a tiny ground floor which is essentially a home delivery & ‘pack’ section. A wooden staircase took us upstairs. I was impressed by the simplicity of the décor & the casual ambience. On one end was the Wood fired pizza Oven & the rest of the room was dining chairs & tables. Tables are for 2 people & they were being joined in different permutations & combinations by the staff to accommodate 4 or 6 or 8 guests together. 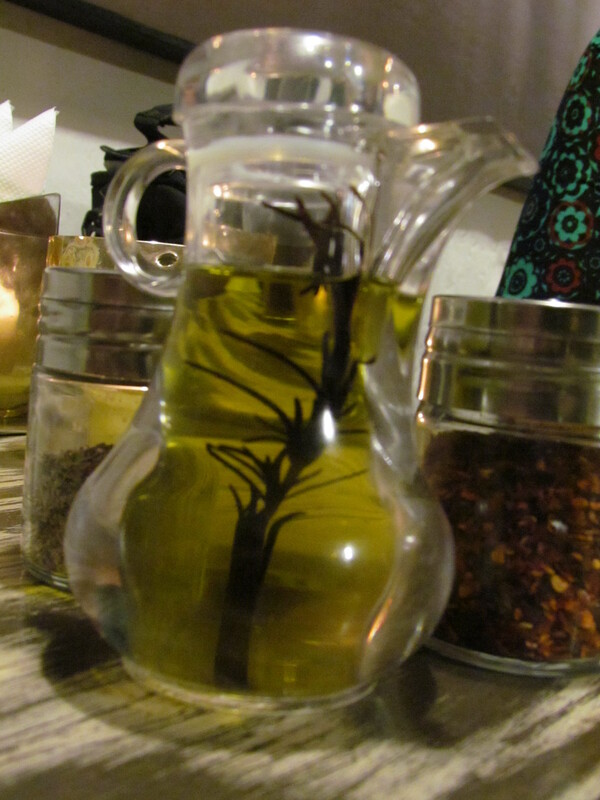 Each table had 3 things – chili flakes, herbs seasoning & most importantly olive oil, in addition to the usual salt, pepper etc. The menu card is a one pager & has an interesting concept: The menu card read – ‘Pick ur base, size, topping & cheese – we wud do the rest’ or ‘choose from our selection of Pizzas’. See the picture below for understanding how the matrix works. Example. 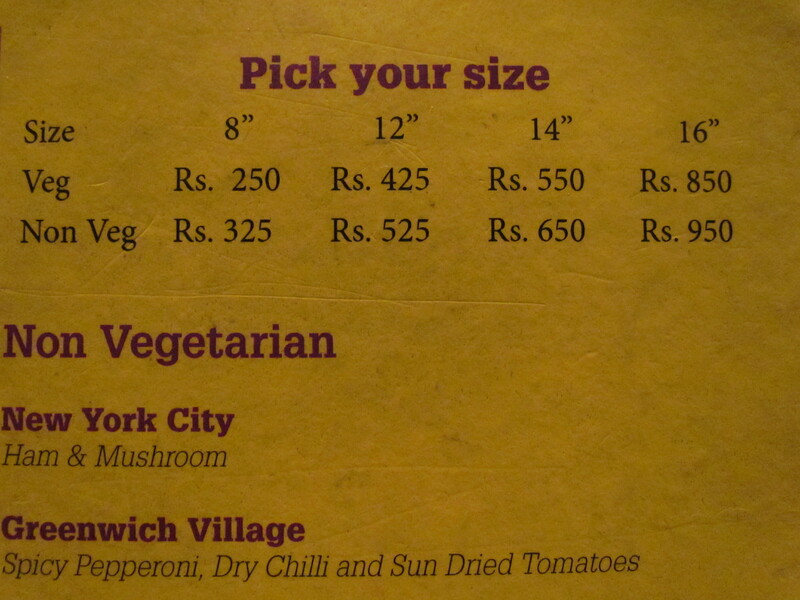 We chose an 8 inch vegetarian pizza with a choice of any 4 toppings. That made it Rs.250. We then chose 1 non vegetarian topping. Those were for Rs. 75 each. So our pizza came for Rs. 325. As mentioned above we were shocked to find the pizzas so good. They were not gourmet kinds that u get in Hilton / Park Hotel but they were excellent. For beverages the only option is lipton ice tea / soft carbonated drinks. The staff members seemed to be new to the job & still learning. However, they tried their best to be helpful. The owner lady was always at the floor & constantly supervising the floor. I was amazed to see that she actually was helping the staff in relocating & re-setting the furniture as well. We started our evening with a lot of enthusiasm – making our own pizza. We chose Provencale herbs for the base in 8 inch size. For toppings we chose roasted red pepper, fresh roasted garlic, sundried tomatoes & red onions. 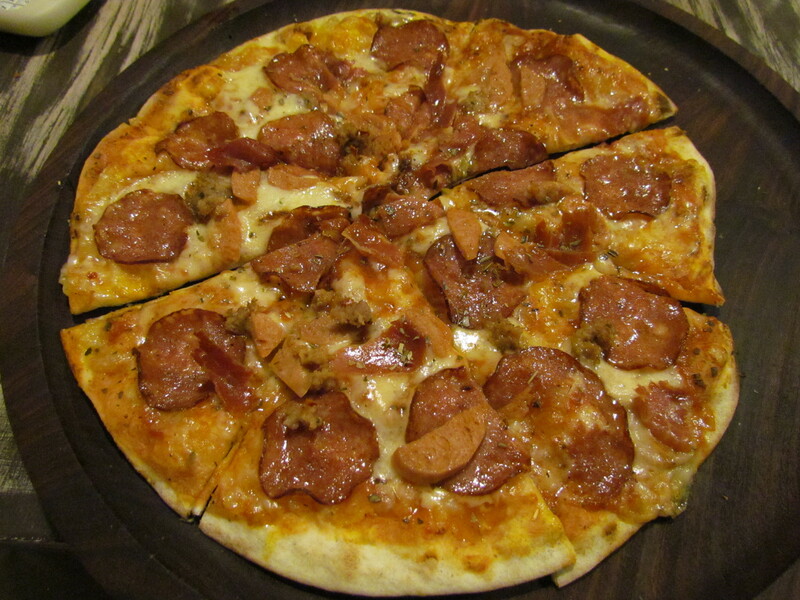 We also chose an additional non vegetarian topping – spicy Italian sausage. For cheese we chose mozzarella. 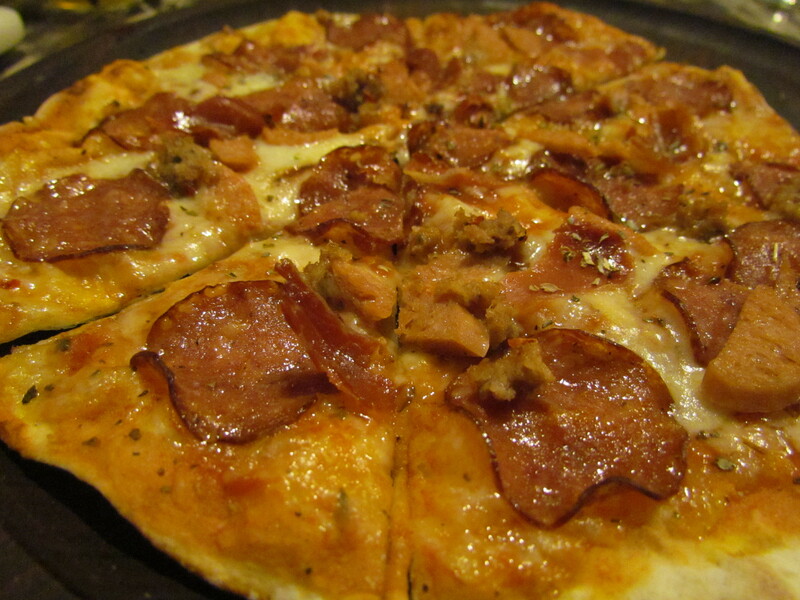 As the pizza arrived, we noticed two things – the super thin crust & the non-perfect circles. 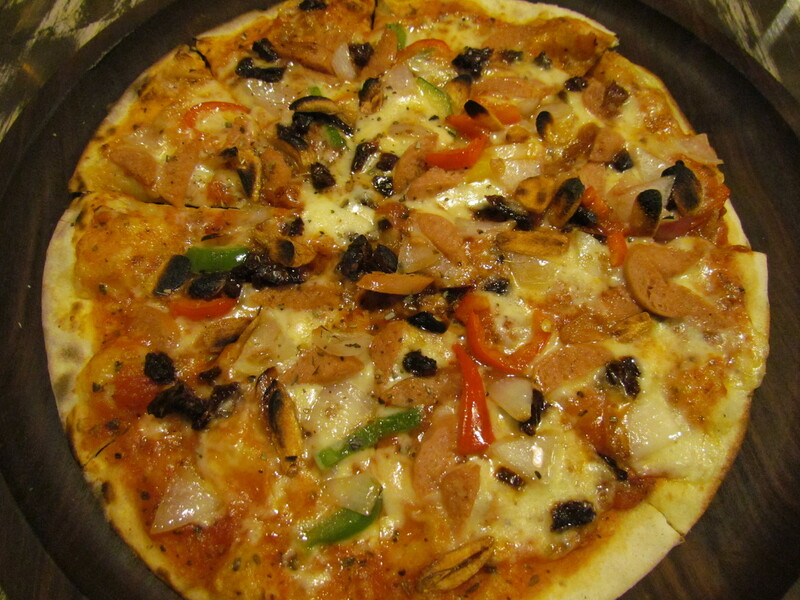 That is exactly how I have eaten in other countries – unlike the perfect shaped perfectly baked MNC pizzas. The first bite gave a sense of disbelief. The second bite reinforced that this was different & third bite onwards my tastebuds were celebrating. Fresh roasted garlic & roasted red pepper stood above the two other toppings. Sausages just gave a meaty hint. A few drops of olive oil, a sprinkling of seasoning & chilli flakes heightened the taste even further. Overall – 4.75/5. As we finished this, we realized that we cud eat some more. So we swam towards our weakness – seafood. This time we ordered a Pizza called Park Avenue. 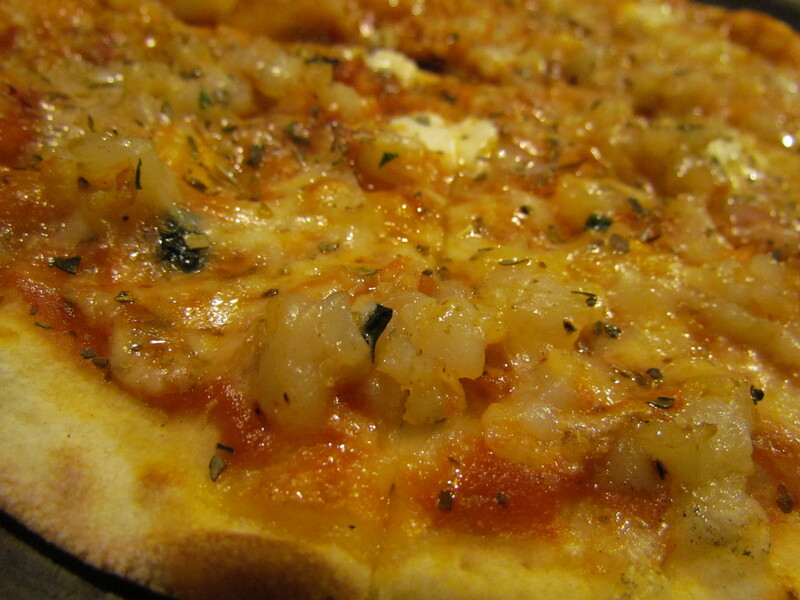 It was Sauteed shrimps, Garlic oil, red onions, feta cheese. After two pizzas (shared by 2 of us), we were still yearning for more. So this time we decided on ‘lets check what is popular here’. So we asked the server & pat came the reply ‘ Soho Pepperoni’. We washed this all down with Lipton lemon tea!!!! Overall – Food is 4.5/5. I wud surely get back here. ….. just two of us, with friends, with groups of friends etc. I am however unlikely to order pizzas by home delivery from Fat Lulu’s coz thin crust pizzas taste good straight out of the oven. After a 20 minutes journey in a closed basket, half the taste & texture is gone. What do u think? Sounds like yet another good find. 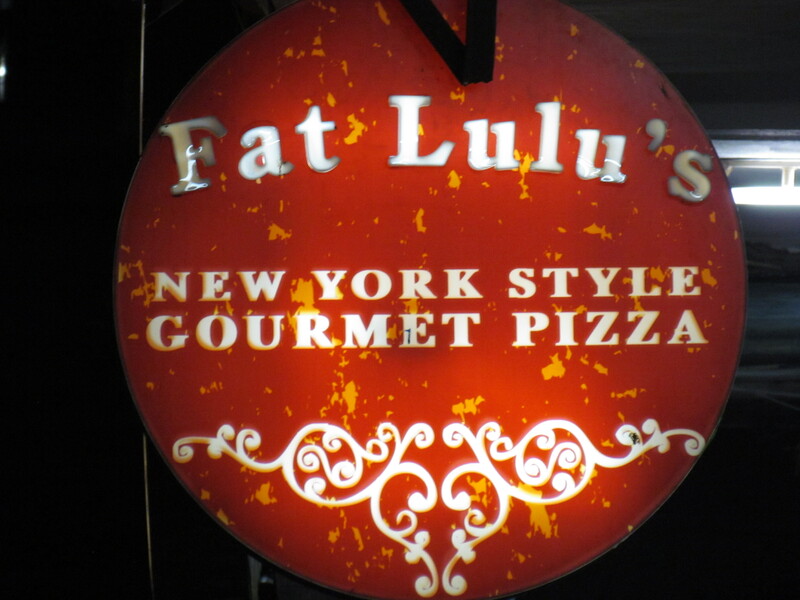 Wondering what the history behind the name is – Fat Lulu’s? Did they serve multigrain or wheat base pizzas? 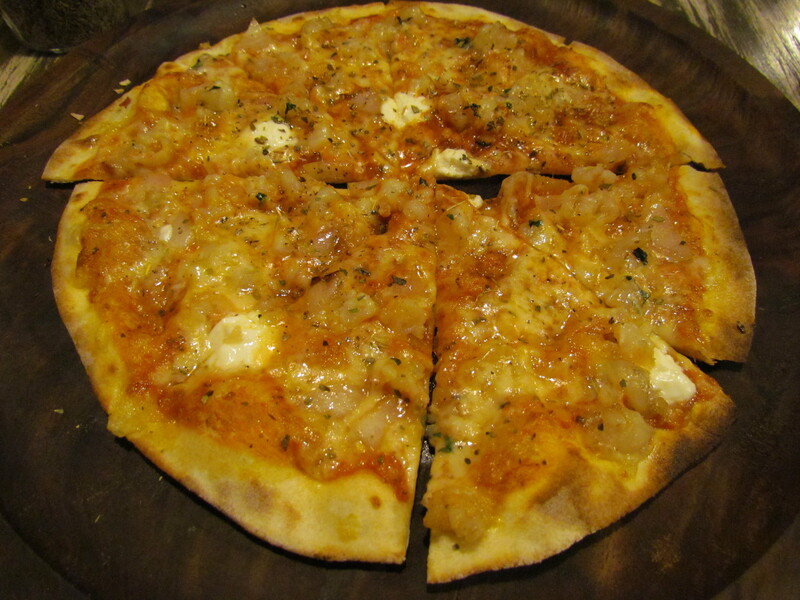 How about any desi flavors such as tandoori chicken or kebab topped pizzas?